This photo was taken in South Acton center before the Route 27 bridge was built across the Boston & Maine RR tracks. South Acton's most prominent landmark, the Exchange Hall is on the left, at the intersection of Main and School Streets. It was the social center of the town and has been many things, including a meeting hall, general store and post office. Main Street (Route 27) crosses from left to right and over the RR tracks, on its way to Maynard. 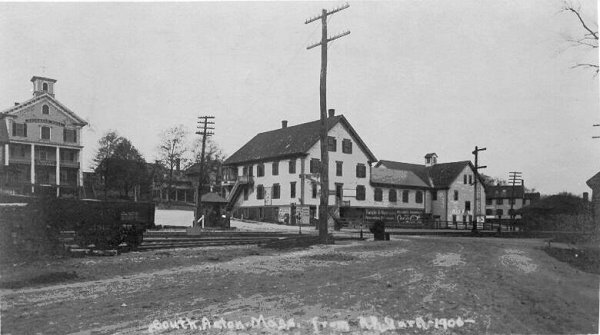 The large commercial building in the center faced School Street, with its back against the RR tracks. It sports several hand painted advertisements. In the foreground is Maple Street. The Marlborough line RR tracks are at the far right. 2001 This was taken from the top of the Main Street bridge, more than 20 feet higher than the old image. Except for some peeling paint, the Exchange Hall is unchanged. It currently hosts an art gallery, karate studio and a woodworking shop. The large building is long gone and has been replaced by the small white cinderblock Civil Defence building. 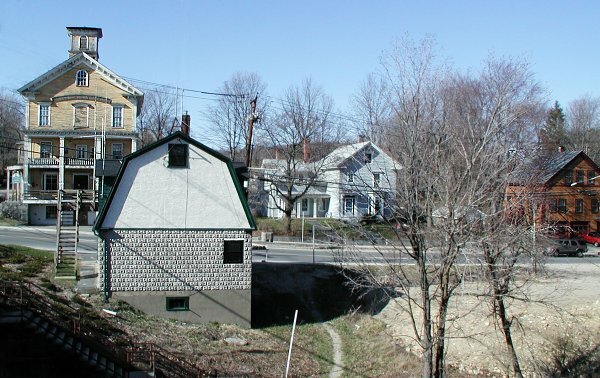 The small white house on School Street is unchanged in both photos.